In the main stairwell of Whitmore Park Primary School there is a large wooden sculpture shown in the picture on the right. The exact history is unknown but it is possible the sculpture is of an Indian black buck antelope which was the military mascot of the Royal Warwickshire Regiment. The shield, which displays an elephant with a castle on it’s back, is the Coventry coat of arms . It was given/donated/presented(?) to the school when the 5th (Warwickshire) Battalion was disbanded in 2000(?). 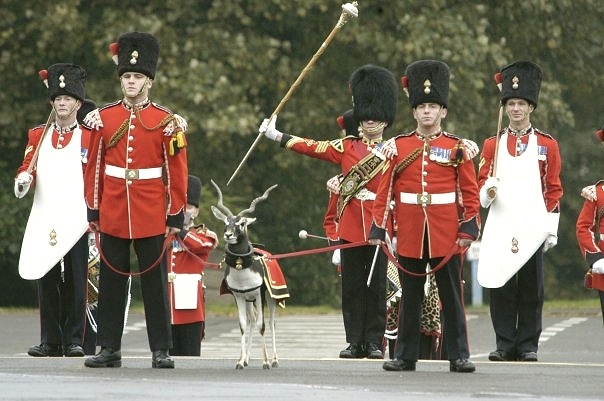 The regiment kept living antelope mascots for around 150 years. He was usually given the name “Bobby” - he held the rank of Corporal and attended all major parades held by the regiment. The Royal Warwickshire Regiment can be traced back to the 17th century. In 1685 King James II created the 6th Regiment of Foot which was renamed 1st Warwickshire Regiment in 1782. In 1832 it became a Royal Regiment and their title was changed to The Royal (1st) Warwickshire Regiment. Over the years the regiment has gained many Battle Honours including at the Somme in the First World War. At that time the regiment raised 30 battalions. 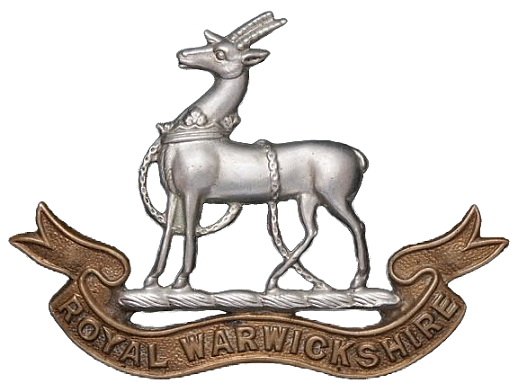 In 1948 the depot in Warwick was closed and the regiment was reduced to a single, regular battalion. 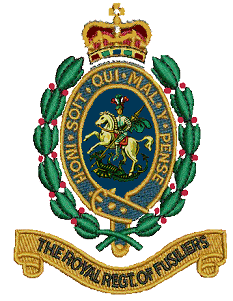 On 1 May 1963 the Queen approved the regiment becoming fusiliers and it adopted the title of Royal Warwickshire Fusiliers. On 23 April 1968 it merged with three other English Fusilier regiments to become the 2nd Battalion of the four-battalion Royal Regiment of Fusiliers . The new regiment inherited the tradition of keeping living antelope mascots, maintaining the tradition until 2005. One of the mascots (born at London Zoo in 1982) lived at the head-quarters of the 5th (Warwickshire) Battalion(?) in Coventry and had his military service recognized at the Tower of London on 24 June 1997, with a Long Service and Good Conduct Medal . When the 5th (Warwickshire) Battalion was disbanded, in the year 2000, Bobby went to live with the 2nd Battalion. The mascot was looked after by two handlers chosen from the battalion who would make sure that he was fed, watered and exercised. When on parade they kept him under control by means of two ropes attached to his collar which was emblazoned with a large silver badge. On his back he wore a coat embroidered with the regimental crest and his horns were tipped with silver cones. Usually quite well behaved on parade, a few of the antelopes have had a mind of their own. During a military review at Aldershot the then Bobby chose to lie down as he was being led past King George V and proceeded to nibble the grass thus bringing the parade to a halt. Although the Regiment has not kept a mascot since 2005, the image of Bobby can still be found on every Fusilier’s No.1 and No.2 dress uniform buttons .